Customers test out iPad minis on display in Los Angeles. Students who received free iPads from the Los Angeles Unified School District in a deal with Apple are finding ways to use them for more than just classwork. Los Angeles Unified School District started issuing iPads to its students this school year, as part of a $30 million deal with Apple. The rollout is in the first of three phases, and ultimately, the goal is to distribute more than 600,000 devices. But less than a week after getting their iPads, almost 200 of the districts' high school students found a way to bypass software blocks on the devices that limit what websites the students can use. Roosevelt High School in East LA has the most offenders. Earlier this week, Mayra Najera, a high school senior, told NPR that she hasn't hacked her school-issued iPad just yet, but that some classmates have offered to do it for her. "They told me Friday, 'I would do it for you because you're my friend,' " she says. "They told me that!" If you weren't a friend, the hack would cost $2. "They were charging people to do it. It was like a little black market," Najera says. The students are getting around software that lets school district officials know where the iPads are, and what the students are doing with them at all times. This software also lets the district block certain sites, such as social media favorites like Facebook. The district's chief information officer, Ronald Chandler, says he wasn't really surprised that students bypassed blocks so quickly. He says that hacks happen at all levels, whether it's secured parts of the federal government, or student iPads. "So we talked to students, and we asked them, 'Why did you do this?' And in many cases, they said, 'You guys are just locking us out of too much stuff.' "
He says, after talking with students, that the Los Angeles Unified School District's iPad policy probably should be changed, allowing for some social media and music streaming sites. "They were bound to fail," says Renee Hobbs, who runs the Media Education Lab at the University of Rhode Island. She's been a skeptic of the iPad program from the start. "Children are growing up today [with] the iPad used as a device for entertainment. So when the iPad comes into the classroom, then there's a shift in everybody's thinking." And sometimes that shift is hard for everybody. Hobbs says this isn't the first time educators have tried to co-opt things that lots of people use for fun. "Back in the 1930s, there was a big initiative to use radio in education," says Hobbs. "It was the original distance education." But, Hobbs says, that all fizzled out. "Within a decade, we discovered that the commercial use of radio, for soap operas and music shows and game shows, actually eclipsed the educational use of radio. And the entertainment function is just so [dominant]. You can't compete," Hobbs says. Los Angeles Unified School District, for its part, says it's addressing what it calls "a glitch" in the iPad software. The district told NPR that for now, the hackers won't be punished. But home use of the iPads has been halted, indefinitely. 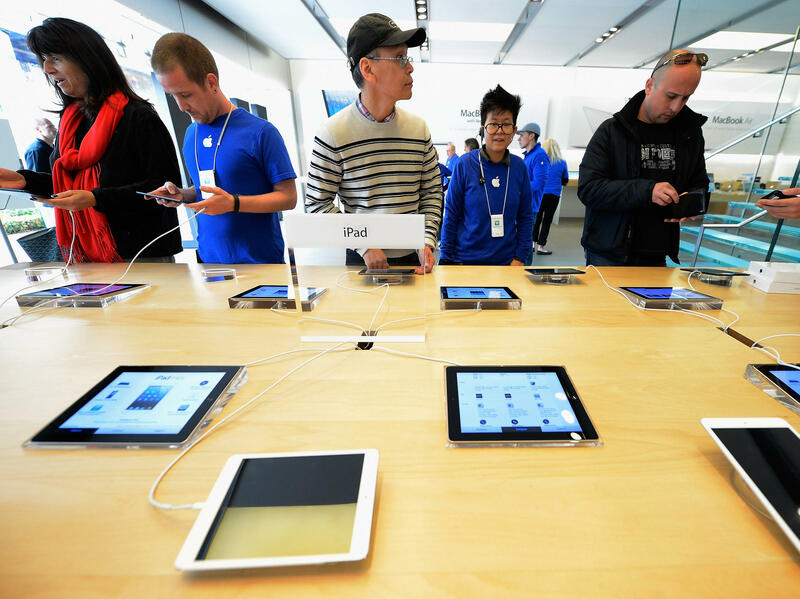 The rollout of the iPads might have to be delayed as officials reassess access policies. Right now, the program is still in Phase 1, with fewer than 15,000 iPads distributed. In November, the district is set to start moving into Phases 2 and 3 of the iPad program. In light of the hacking scandal, Mayra Najera, the Roosevelt High School senior, isn't sure she needs an iPad at all. "It's hard to tell," she says. Najera says she doesn't even do digital homework on her school-issued iPad. She takes care of that on her personal iPhone 5. OK. Here's another reason to worry about distributing iPads to students. Young people today can be pretty savvy with technology. Like, say, they're good at hacking iPads given to them. Nearly 200 high school students in the Los Angeles Unified School District breached the security locks on their school-issued iPads so they could surf the Internet at will. NPR's Sam Sanders reports. SAM SANDERS, BYLINE: Mayra Najera is a 17-year-old senior at Roosevelt High in East LA. She hasn't hacked her school-issued iPad just yet. But some classmates have offered to do it for her. MAYRA NAJERA: They told me Friday, I will do it for you because you're my friend. (Laughter) They told me that. SANDERS: And if you're not their friend? Well, Mayra says it'll cost. NAJERA: They were charging people to do it. It was like a little black market. SANDERS: The students are hacking around software that lets Los Angeles Unified School District officials know where the iPads are, and what the students are doing with them - all the time. This software also lets the district block certain sites. SANDERS: Roosevelt sophomore Juan Escalante tried to show me the hack on his iPad just outside of the school. SANDERS: But, he realized, it was already done. ESCALANTE: Oh. (Laughter) Wow, my friend already deleted the files. SANDERS: I asked the school district's chief information officer, Ronald Chandler, about all of this. Were you surprised when you heard about this? SANDERS: Chandler says that from the most secured parts of the federal government to kid's iPads, people just hack. He does admit that the Los Angeles Unified School District's iPad policy probably should be changed. CHANDLER: We talked to students, and we asked them, why did you do this? And in many cases, the students said, listen, you guys are just locking us out of too much stuff. RENEE HOBBS: They were bound to fail. SANDERS: Renee Hobbs runs the Media Education Lab at the University of Rhode Island. She's been a skeptic of the iPad program from the start. HOBBS: Children are growing up today with the iPad used as a device for entertainment. So when the iPad comes into the classroom, there's a shift in everybody's thinking. SANDERS: And sometimes, that shift is hard for everybody. Hobbs says this isn't the first time educators have tried to co-opt things that lots of people use for fun. HOBBS: Back in the 1930s, there was a big initiative to use radio in education. It was the original distance education. SANDERS: Hobbs says that all fizzled out. HOBBS: Within a decade, we discovered that the commercial use of radio - for soap operas and music shows and game shows - actually eclipsed the educational use of radio. And the entertainment function is just so dominant. You can't compete. SANDERS: Los Angeles Unified School District, for its part, says it's addressing what it calls, quote "a glitch" in the iPad software. The district told me that for now, the hackers won't be punished. But home use of the iPads has been halted indefinitely. And that's OK for Roosevelt senior Mayra Najera, who isn't sure she needs one at all. NAJERA: It's hard to tell. It's good to have an iPad. But then, we shouldn't have iPads. SANDERS: Najera says she doesn't even do digital homework on her school-issued iPad. She takes care of that on her personal iPhone 5.